And the state is called– The Sooner State. The thought of free land happiness brings. 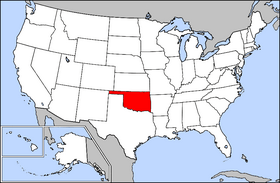 Words “okla” means people and “humma” means red. It became a town in 1893 is what I read. The animal is the~~ American Buffalo. The Nation is called Anadarko. Of the entire fifty states. Over one million miles of lakes. Outlaws lies in a grave with no explanation. Is the capital of the Cherokee nation. First public school for higher education. Of the first American main artillery fort. For trained soldiers on a world court. The first electric guitar in nineteen-thirty-five. Of the Mississippi to broadcast live. The largest in Oklahoma’s naturals faults. And the chosen dance is the Oklahoma Waltz. There is Guthrie, Mickey Mantle and Garth Brooks. Patti Page, Brad Pitt and Maria Tall Chief. Nickname for State: The Sooner State. The nickname describes land-hungry settlers, who rushed to claim territory opened for settlement. Belle Starr one of America’s notorious woman outlaws is buried in an isolated grave southwest of Porum with no explanation. The official flower is the~~ mistletoe. The state bird is the~~ Scissor Tailed Flycatcher. National Memorial in Oklahoma City has set up a memorial on April 19, 1995 for the survivors, rescuers of the bombing and the ones who met their fate.